Pretending is always fun for preschoolers. So, what is better than a whole song of pretending to be different animals?!? 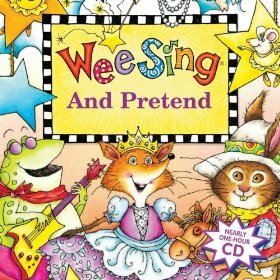 Today on Handpicked Songs for Preschoolers, I’m recommending a song from our friends at Wee Sing. They’re so prolific and preschooler-friendly that they were bound to come up again! In case you missed it, I recommended an awesome song from them in Week 4.
has everything from penguins and lions to worms and peacocks. There is also a fun chorus that comes back a few times, encouraging kids to move their bodies and feet to the rhythm. Whether or not your child actually moves to the beat, it’s still a great time to experiment with the concept. It takes a lot of large motor control to move your feet in time to the beat. So, if your child doesn’t have it right at first, don’t sweat it. Preschool is the perfect time to start learning to control your body rhythmically. A child’s level of familiarity with the song also contributes to how well he or she can move with the beat. Watch and see if they get closer and closer to the beat the more they hear the song. You can find Animal Action on Amazon or itunes. Go find this song and start moving! Have thoughts or questions about rhythm and movement for this age group? Share them in the comments below. I'm a musician and teacher, based in Seattle. In my mind, there's nothing quite like sharing my love for music and the piano. Really. Nothing like it. Caspar Babypants is going to be at the PNA on April 5th! Good to know, Libby! Thanks for sharing. And, thanks for reading! © 2013 Stacia Cumberland. All rights reserved. Fine Photos by Sparkfly Photography. Illustrations by the most talented Jocelyn Skillman.